The awareness of the Higher Self, as the Higher Aspect of who we truly are, beyond our personality self, has been known throughout the ages. Many saints and sages have spent lifetimes using meditation, yoga, prayer and seclusion to accomplish this. Discovering and connecting with your Higher Self might be easier than you think! We are in an age where more and more people are naturally awakening spiritually. Humanity is ready for an evolutionary quantum leap. Deepen your relationship with God/All that Is. Assists you in merging with your Higher Self. All four parts are infused with higher vibrational energy to help keep your energy high while you are integrating your Higher Self. After you have fully merged with your Higher Self, you can still use them for a quick energy boost and as a reminder of where your true source of power lies. “It has been an absolute blessing to experience the Merging With Your Higher Self meditation with Ed and Monika. Even with years of taking care of my own spiritual energies and practices, this meditation has brought a level of calm and peace that goes beyond words. Every time I meditate, I feel my own body and energy expand, as if trying to accommodate and acclimate to these higher frequencies and vibrations. I feel all things that have been bothering me, conscious and unconscious, effortlessly wash away. The peace that I am left with is so light and powerful, that I feel both stable and detached from the world and all the collective stress and drama I see around me. This meditation has really helped me KNOW what it means to be “in this world but not of it.” I am deeply touched to be with and know my Higher Self like a dear friend, who really is my-self. I am filled with a certain sense of faith and knowingness that my life is a gift and I am okay at all times. Of course, everyone will have their own unique experiences as they purify and merge with their Higher Self, but I have experienced greater access to my intuition and other synchronicities. My friends and acquaintances have commented at how much they feel at ease around me. I seem to be at the right place at the right time, and I am seemingly able to communicate just what needs to be said in person or in writing. Another interesting observation is that many people I do not know will greet me or strike up a conversation with me. Animals and children also approach me often. I have a higher baseline level of energy, and being happy and content seems natural. I also do not feel lonely, and actually prefer to spend time by myself, though I love my friends and family. I almost want to be in communion with God all the time now! Yes! I want to connect, integrate and merge with my own Higher Self and feel the bliss, acceptance of what is, and joy that comes with radiating my true Self to the Universe! Send me the Merging With Your Higher Self CD for only $39.95 plus shipping & handling or get the download version for only $39.95 with no shipping and handling fees. “Late last night, I used the new Merging With Your Higher Self mp3 that Ed and Monika recently created. It started out being nice and relaxing, as intended. As it progressed, I felt a lot of Pineal/Pituitary energy in my head, then I felt that familiar “hand slipping into the glove feeling” just like during my private session with Ed when my Higher Self came into my personality self. And it happened with just the CD! This is just what I need to stay connected! I just wanted to add, I have found repeated use of this mp3 leads to an expansion of the depth of the experience. During my latest session, I experienced a deeper spiritual connection, as well as a new level of emotional release. Even better, the duration of my conscious awareness of the connection of my Higher Self increased! For a private Higher Self Integration session with Ed visit: Higher Self Integration. The Best Guided Meditation I Have Experienced! "This is the best guided meditation I have ever experienced and I have been meditating and energetically clearing people worldwide for over 30 years! This tool raises my energy high enough so I am able to direct healing energies to my clients and it has increased my clarity so I am able to diagnose my clients more easily. 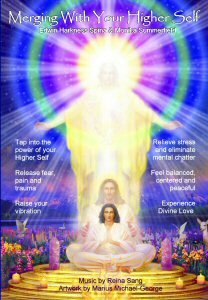 For all you healers or lightworkers this Higher Self Merging meditation is the instrument you need to amp up your abilities." "I ABSOLUTELY love the Merging With Your Higher Self meditation! I cannot emphasize enough what an amazingly perfect journey this is. I am so thankful, as now I know that, no matter what, all is well. The light of my Higher Self lies firmly within me! Thank you! My compliments to Monika, as well - her voice is quite soothing. I look forward to doing this again tomorrow." I Feel Like a Teenager! "OMG! I'm 61 yrs old and have been meditating since I was in my twenties. This is the best guided meditation I have ever listened to. It increases my frequency and boosts my vibration. I have so much energy, I feel like a teenager! I listen to it every day. My body feels better than ever and my Higher Self is securely within me! It feels so wonderful that I often don't want to come back!" "I've listened to Merging with Your Higher Self many times. Each time I'm led to a very deep state of consciousness and relaxation. After each listening, I feel clearer and that some further blockage to my Higher Self has been removed. I also notice that I'm receiving more intuitive insights and more synchronicities are occurring."